Together with our partners, we offer certified hardware individually tailored to your needs. 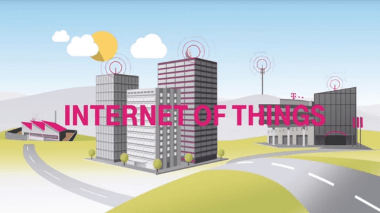 Benefit from Deutsche Telekom's best infrastructure for your IoT projects. Use the best IoT service platforms for the central management of your devices and SIM cards. Gain valuable insights thanks to Big Data with intelligent filtering and linking of your data using numerous cloud-based tools. The Internet of Things - what is it actually? In short: All kinds of things - from machines, pallets and containers to traffic lights, street lamps and electricity meters to garage doors, parking lots and vehicles of all kinds - are equipped with sensors and connected to the Internet. The sensor data is sent to the cloud via radio or fixed network to be analyzed. Why? Because the knowledge gained in this way can be used to optimize processes, reduce costs and time, maximize profits or implement new ideas and business models. Deutsche Telekom will show you how it works. The wireless standard NarrowBand IoT (NB-IoT) is optimised for applications in the Internet of Things. It uses existing mobile networks – and thanks to its unique features, NB-IoT enables numerous devices to be networked with low energy consumption. A secure marketplace for efficient data transfer – that’s our Data Intelligence Hub. Get access to open data as well as closed data pools while gaining insights tailored to your needs with integrated analysis tools. We guarantee the highest security standards and data sovereignty. Manage and control all your connected devices with Deutsche Telekom’s “Cloud of Things”. The cloud-based IoT platform collects, analyzes, and visualizes sensor data from various machines. Our Starter Kit offers you quick and easy entry. We are taking IoT to the next level! 10.04.2019|Since April 1, Rami Avidan has been responsible for the IoT business at Deutsche Telekom. He celebrated his debut directly at the Hannover Messe and got to know the great team. Now he talks about his impressions. 04.04.2019|With wireless sensors that measure the temperature, humidity, brightness and CO2 content of indoor air, the Internet of Things provides more security, comfort and transparency in schools, hospitals and large offices. 03.04.2019|Danish building service provider ISS Facility Services relies on T-Systems` “Connected Things Hub” for its building management worldwide. 03.04.2019|POLYGONVATRO and Deutsche Telekom are taking dehumidifiers into the Internet of Things. 25.03.2019|The transport and logistics industry drives far ahead of other industries and large parts of production when it comes to digitization. The Internet of Things offers companies many opportunities to digitize and improve their machines, goods or processes. 21.03.2019|According to a study by Ernst & Young, the digital economy offers telecommunications companies plenty of opportunities for growth. Requirement: They develop new business models around IoT and M2M communication. You need further information about one of our offers or have a specific question? Send us an email - our IoT experts are happy to help you. Or simply use our contact form for more information.